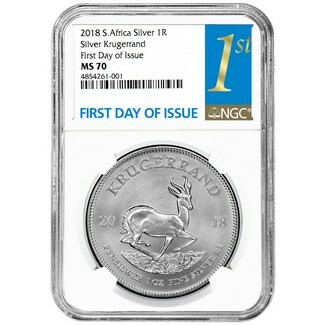 Officially released on August 1st, 2018, this is the brand new 2018 SILVER Krugerrand. Its only the second-time this has been struck in silver, with a stunning design originally used in 1967. The obverse depicts with image of Paul Kruger, with the iconic springbok on the reverse. This coin is certified in perfect MS70 condition by NGC, with First Day Issue notation.